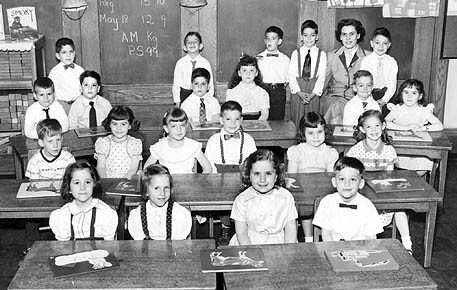 A Picture History of Kew Gardens, NY - Class Pictures - PS99 Kindergarten AM 1954. FROM: Bill Lowenberger of McCandless, Pa. Seated in the front row, from the left: unknown, Bradley Beam, unknown, Bill Lowenberger. Second row, from left: Richard Siegel, Pamela Leaman, Judy Seidman, Ronald Kartman, unknown, Wendy (?). Third row, from left: unknown, Roger Briton, unknown, Martha Revitt, Donald (? ), Patricia Garber. Standing, from left: Lawrence Berkwitt, Herbert Bachner, unknown, Roy (? ), Mrs. Bierman, Larry Sloman.